The Senate Foreign Relations Committee chartered an investigation in 1961 aimed primarily to unearth—and properly regulate—the activities of Israel lobbying organizations funneling hundreds of millions in U.S. and foreign donations into relief and political activities. During the course of the investigation and hearings, the committee discovered the Jewish Agency for Israel, a registered foreign agent, was improperly funneling millions into lobbying and public relations campaigns for Israel. Jewish Agency "conduits" included the American Zionist Council, its unincorporated lobbying division the American Israel Public Affairs Committee, the Jewish Telegraphic Agency and American Israel Public Affairs Committee founder Isaiah Kenen's Near East Report, among others. Getting the IRS to cooperate with the investigation was no easy task. Committee Chair Senator J.W. Fulbright had to obtain two separate executive orders from JFK in order to finally obtain the cooperation of the IRS. Even this cooperation was limited, and by order of IRS Commissioner Mortimer Caplin allowed only three senate staff to review tax records, with the proviso that the Senate Foreign Relations Committee not publicly disclose sensitive information in the open hearings about Israel lobbying groups taking place in May and August of 1963. Commissioner Caplin admitted that Israel lobbying organizations—as a result of facts surfaced during the Senate hearings—had engaged in many activities they had not disclosed to the IRS during their applications for tax-exempt status and periodic IRS reviews. For example in the Jewish Agency's 1952 application for tax exempt status, it failed to disclose that it was registered under the Foreign Agents Registration Act (since 1938). According to Caplin, none of the Jewish Agency's financial statements disclosed "expenditures on behalf of a foreign principal." The IRS was again bamboozled during a 1960 review ruling affirming the Jewish Agency's exempt status when the organization again failed to disclose it was a foreign agent. The Jewish Agency's New York branch in 1961 received $1.4 million ($11 million in 2015 dollars) from the Jewish Agency, in "charitable contributions from all over the world." But among 34 Jewish Agency publications circulated in America, only one properly disclosed it was the product of a foreign agent, according to Caplin. Nevertheless, despite these deceptions and cognizant of facts raised in the May 1963 Senate hearings, "the Service held in a ruling dated July 26, 1963 that the American Section qualified for exemption pursuant to the provisions of section 501(c)(3) of the Code." The IRS claimed it was unware of any political activities conducted the American Zionist Council or that it was receiving Jewish Agency funds, some of which were transferred to Christian organizations and a pro-Israel think tank. In fact, the IRS had no information of this massive operation more recent than 1952. Caplin also said the IRS granted the Jewish Telegraphic Agency tax exempt status in 1939, but was not aware its ownership had been transferred to a holding company of the Jewish Agency. Caplin did not reflect on the Jewish Agency's subsidization of this key mass media outlet or other issues raised in the Senate Foreign Relations Committee hearings. In the end, the IRS stated that based on the Jewish Agency's formal announcement in 1960 that it would bre reorganized and expand its board of directors to include apportionments of U.S. citizens, and other promised reforms, that the IRS was reaffirming the Jewish Agency’s tax-exempt status. Mortimer Caplin left the IRS on July 10, 1964 without its "expanded exempt organizations audit program" ever taking any apparent action on issues raised by the Senate Foreign Relations Committee. The Jewish Telegraphic Agency, one of the targets of the Senate investigation, breathed a sigh of relief when Sheldon Cohen then assumed the mantle of IRS Commissioner on January 25, 1965, reporting "Sheldon S. Cohen, 37-year-old District of Columbia native, who was nominated this week by President Johnson to be the new Commissioner of the U.S. Internal Revenue Service, said today his two 'pet charities' are the local Jewish Social Service agency and the Jewish Community Center." The American Zionist Council was ultimately disbanded by a 1962 Foreign Agents Registration Act order issued by Robert F. Kennedy. Just six weeks after the order, the American Israel Public Affairs Committee (AIPAC) split off and incorporated as a separate organization. AIPAC did not disclose on its 1967 application for tax exempt status to the IRS that it had been part of an organization ordered to register as a foreign agent. In 1968, Cohen's IRS granted AIPAC tax exempt status, retroactive to 1953, the year AIPAC first began lobbying as a division of the American Zionist Council. Archivists note: Because Congressional records are not subject to the Freedom of Information Act, researchers must often wait fifty years (or more) in order to obtain access such records. The Senate Foreign Relations Committee records scanned and made available below (and other sections of this website) were released in 2010, a few years early. Nevertheless, some records from the investigation, including all of the microfiche, remain unavailable or classified. 11221962 November 21, 1962 executive order on tax returns from John F. Kennedy and accompanying White House press release. "It is hereby ordered that any income, excess-profits, estate, or gift tax returns for the years 1950 to 1962, inclusive, shall, during the Eight-Seventh Congress, be open to inspection by the Senate Committee on Foreign relations...in connection with its study of all non-diplomatic activities of representatives of foreign governments...attempt to influence the policies of the United States and affect the National interest. 01031963 Senator J.W. Fulbright requests ongoing access to tax records from JFK. 01071963 JFK legislative advisor Myer Feldman responds. "I will see that appropriate action is taken on your request." 02141963 IRS Commissioner Mortimer Caplin grants onsite inspection access to Senate staff John H. Yingling, Walter Pincus, and Charles Sifton. 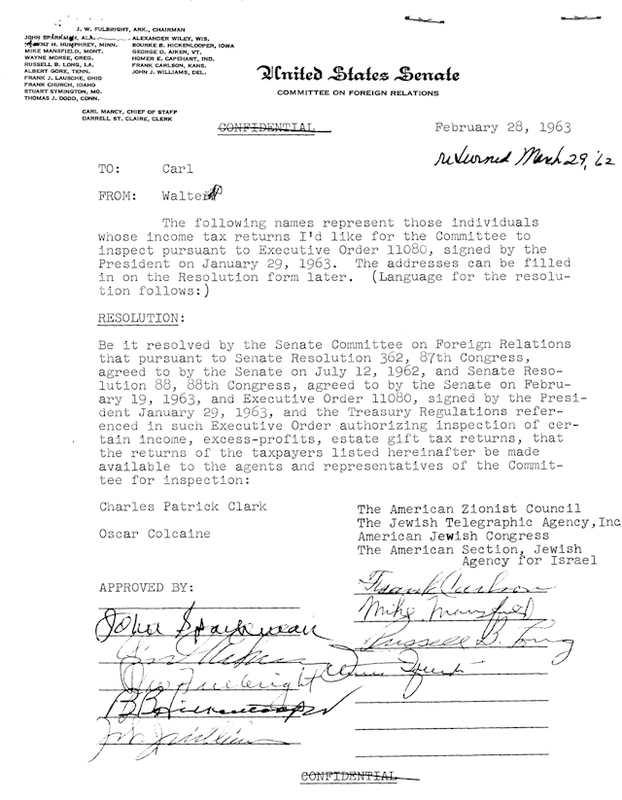 02281963 Confidential request signed by the Senate Foreign Relations Committee to obtain the tax records of the American Zionist Council, the Jewish Telegraphic Agency, and the American Section of the Jewish Agency for Israel. 04251963 IRS Director of the Enforcement Division cautions against public disclosure of tax return data. "Mr. McAleer stated that the Service's position was that the Committees could not breach the confidence under which taxpayers reported their income to the IRS by presenting documents or returns obtained from IRS files or by using, in any way, in a matter in which information stemming from IRS files might come to the attention of the public." 08131963 Senator JW Fulbright asks Secretary of Treasury Douglas Dillon for status of the Portuguese-American Committee on Foreign Affairs, the American Committee on Africa, The Christian Crusade, The Jewish Agency for Israel, The Jewish Agency-American Section, the American Zionist Council, the Jewish Telegraphic Agency, American Christian Association for Israel, Council for Middle East Affairs, American Israel Public Affairs Committee, United Jewish Appeal and the Committee of One Million. "I would appreciate information as to whether or not they have tax-exempt status, and if contributions to them are tax-deductible to the donors. In each case where an exemption has been granted I would like to have indicated the facts applicable to the specific organization that brought it under the statutory provisions for tax exemption. I would also like to know if the facts developed during the Foreign Relations Committee hearings with regard to each organization named are consistent with those presented by such organization in its application for tax-exempt status." 08151963 Office of the Secretary of Treasury responds, "your letter...is receiving attention." 09101963 IRS Commissioner Mortimer Caplin interim response that IRS tax-exempt status was granted to the Jewish Agency for Israel, The Jewish Agency-American Section, the American Zionist Council, the Jewish Telegraphic Agency and United Israel appeal, among others, but not the American Israel Public Affairs Committee. 01161964 IRS Commissioner Mortimer Caplin's final response to the Senate Foreign Relations Committee. "...in certain cases information developed at the hearings of the Foreign Relations Committee was not contained in the material submitted to the Internal Revenue Service in support of the claimed exemption. We have conscientiously tried to report fully to you any such differences, however we are not in a position at this time to evaluate their significance in determining the right of such organizations to enjoy exempt status. On the other hand, we can assure you these differences are being taken into account in connection with the expanded exempt organizations audit program."